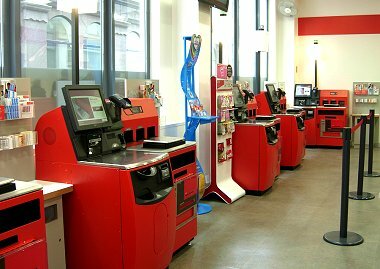 The ambitious 'Post & Go' project by Royal Mail and Post Office Ltd started, in October 2008, with the installation of the first two Wincor Nixdorf postal kiosks in Bristol (see article >, also published in VARIABLE 11). Hundreds of kiosks were installed, during the following months, in major post offices across the country, with excellent results. 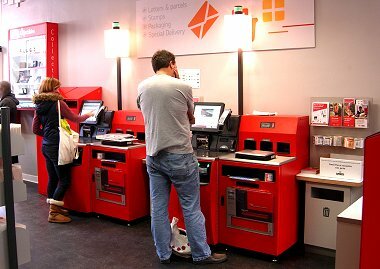 The machines are easy to use, have few breakdowns, and most maintenance can be done by the post office staff. 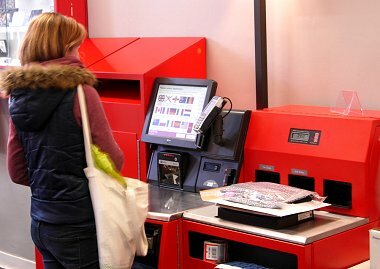 As a result, the kiosks have a had a high acceptance by postal users, who commonly use them to arrange basic postal operations. Considering these circumstances, Post Office Ltd has taken a further step forward with the development of a new generation of kiosks that could offer a more complete range of postal services. In this case, they chose the self-service kiosks, offered by the multinational NCR, which are similar to those currently installed in the main post offices in Australia. 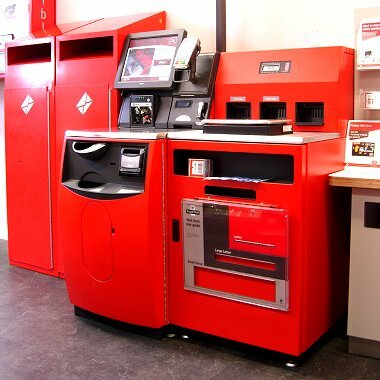 The first two kiosks were installed on February 28th 2014, at the Crown Post Office branch in Harpenden, Hertfordshire, north of London (right image). 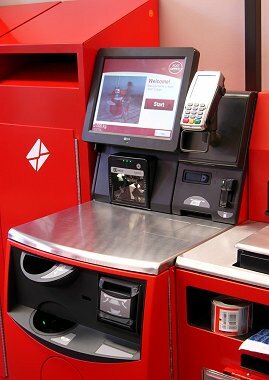 During the following months, new NCR postal kiosks were installed in post offices across the country. This progressive roll out is part of the Crown Transformation Programme, a refurbishment process by the Crown Post Offices, the post offices operated directly by Post Office Ltd, which includes the modernization of the location for self-service equipment. In some cases, there are post offices that had never had 'Post&Go' equipment before, whilst in many other branches, the NCR kiosks replaced the Wincor Nixdorf equipment, according to the post office needs. Such is the case of the City of London post office, in Eastcheap, London. On April 7th 2014, the two initial Wincor Nixdorf kiosks (codes 030003 1 & 030003 2), totally insufficient during some periods of the day because of the large influx of customers, were replaced by five new NCR kiosks (new codes 030003 67 to 030003 71) (left image). 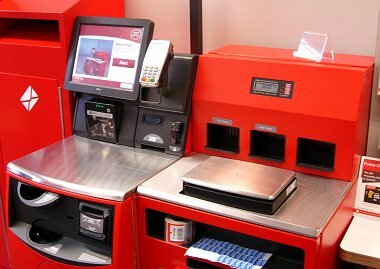 The new NCR postal kiosk is based on the NCR SelfServ Checkout equipment, the self-service payment machines installed in many supermarkets and shopping centres in the UK. On the left, the main unit includes the touch screen, the device for payment by card, a scanner, and the two-sided thermal receipt printer. At the bottom, the payment device for coins and banknotes. This kiosk can return change in coins and banknotes. At the right hand side, the machine includes an additional unit, specially developed to meet the needs of Post Office Ltd, with a scale and three printing units for stamps and mailing labels. At the bottom, a tray for mailing labels and a panel to check the size of the postal item. During the early months, only two printing units were in service, fitted with Custom VK80/300 thermal printers - one printing stamps for priority mail (1st Class), and the other for economic mail (2nd Class). After impression, the 1st Class and the 2nd Class stamps are cut and delivered from different receptacles (image below, right). As for the Wincor Nixdorf postal kiosks, the new NCR machines allow users to obtain stamps, according to the destination, weight and shipment type (option 'Post an item' on the main menu - right image), or buy stamps for later use ('Buy stamps' option). 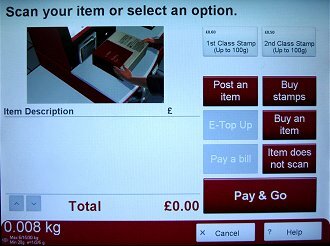 Using the built-in scanner, users can also pay for the postal and packaging products on sale in the post office ('Buy an item'). 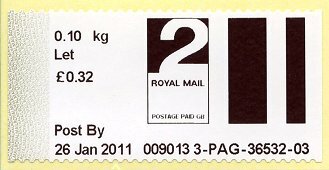 Through the 'Buy stamps' option, the system offers the direct purchase of stamps with 8 programmed postage rates - Six for priority mail, the usual values included in the 'Collectors strip' (images below) and, for the first time, two for domestic economic mail ('2nd Class up to 100g' and '2nd Large up to 100g'), printed on rolls of labels with the 'Machin 2nd Class' definitive design (left image). As seen in the images, the font imprint used by NCR kiosks is different from other equipment in service, thus a new print variety. 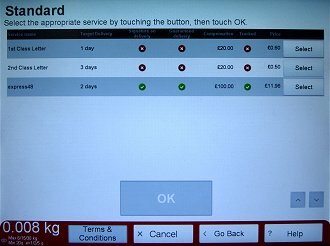 The first strip on the left shows the 6 values ​​included in the 'Collectors strip' for priority mail or 1st Class, during the first few weeks in service of the new NCR kiosks. The second series includes the face value indicators, after changing postage rates in March 31st 2014. As a consequence of the changes in the tariff structure, two of the six face value indicators, programmed - the 'Worldwide up to 10g' & 'Worldwide up to 40g' were replaced by 'Europe up to 60g' & 'Worldwide up to 60g', respectively. Then on June 5th 2014, the 'Europe up to 20g' indicator was modified to 'Euro 20g World 10g'. (More information on changes in the face value indicators, see article >, also in VARIABLE 33). By selecting the 'Post an item' option from the main menu, the user can obtain a stamp, for (theoretical) immediate use, although it does not include the purchase date. 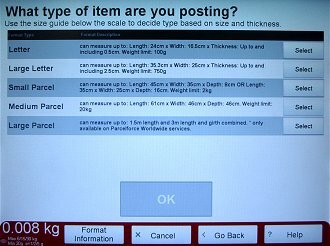 To do this, the user needs to place the letter or parcel on the scale, and select the destination, the type of item to mail, and services or shipment type required (screens below). 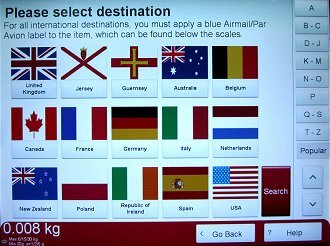 Unlike Wincor Nixdorf kiosks, customers can use the new NCR equipment for almost all types of domestic and international shipments. Before, most of the special shipping options, such as guaranteed and/or tracked services, were only available over the counter. 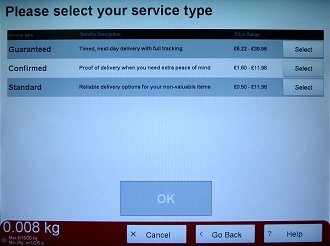 To do this, when the user selects one of these special shipping options, the machine emits a bright light to call the post office staff, who unlocks the kiosk, and finalizes the operation by collecting the franked mail item, by hand. The result of this (long) process is a new variable value stamp with the printed information, 'Open Value stamp', unique to this type of postal kiosk. The stamp includes the face value indicator in the upper left corner (1LG - '1st Class Large Letter', pictured). 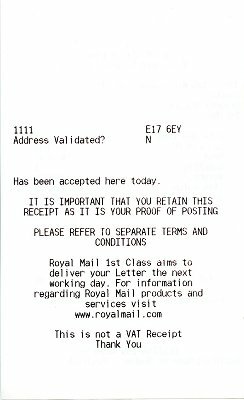 In some cases, the service type is also printed below the postage rate indicator (eg, 'Signed For', 'Letter', ...). 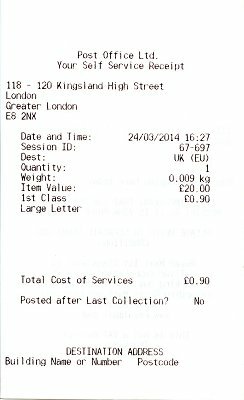 On the right, the VAT code, depending on the destination and shipment type (C4 in the picture), the total paid (£0.90), the destination ZIP code (in some shipment types only, E17 on this stamp) and the weight (0.009kg). The block at the bottom of the stamp is formed by the post office code (013002), the kiosk number (67 *), the session number (000697) and the stamp issued in that session (28). 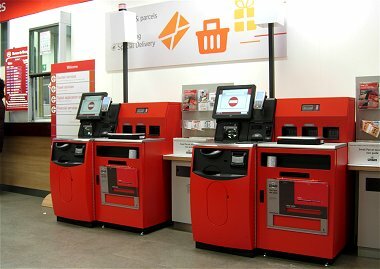 (* In all post offices, the numbering of the NCR postal kiosks starts with 67). 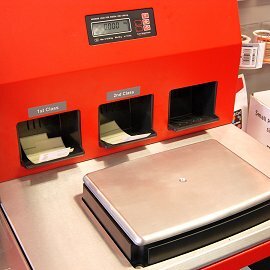 The thermal receipt printer, included in the NCR kiosks, prints on both sides of the paper, simultaneously. The receipt on the right corresponds to the upper stamp. In addition to information on the issue of the stamp, the user can even include the recipient's address, transforming the receipt into a real proof of posting. This new type of 'Open Value' stamp, printed on the same rolls of self-adhesive labels used for the later use stamps, replaces the large size variable value stamps issued by Wincor Nixdorf postal kiosks (right image - see article >, also in VARIABLE 14). The images below correspond to the 5 most common values for ​​priority mail (1L - '1st Class Letter', 1LG - '1st Class Large Letter' & A Letter - 'Airmail') and economic (2L - '2nd Class Letter' & 2LG - '2nd Class Large Letter'). 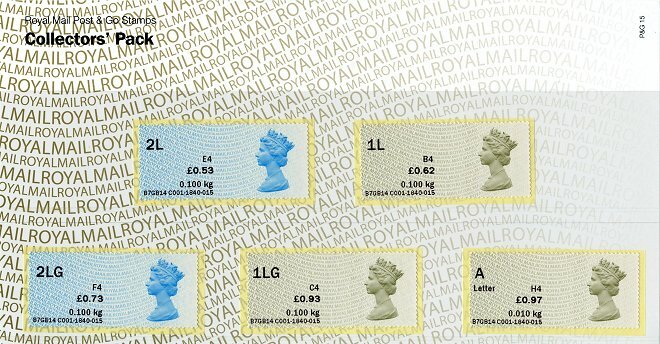 On the occasion of the introduction of this new type of variable value stamp, Royal Mail released, on July 7th 2014, a new 'Collector's Pack' which includes three '1st Class' or priority mail stamps, and two '2nd Class' or economical domestic mail stamp, printed on the 'Machin' (original) and 'Machin 2nd Class' (reprinting 2012) definitive designs, respectively. As can be seen by comparing the images of the stamps in the folder with the upper set, these stamps are not actually printed by an NCR postal kiosk, but -for the first time- with the IAR internal use terminal C001, imitating the NCR printing. The bottom code is the same for all the stamps - In this case, B7GB14 C001-1840-015. B is for the machine type (Intelligent AR), 7 is for the month of issue (July), GB for the country, and 14 for the year of issue. In the second block, C001 is the code of the printing terminal. Then follows 1840, the fictitious session number (taken from the year of issue of the Penny Black), and 015 indicates the series number, from the beginning of the Post & Go issues. During the first few weeks in service, all NCR postal kiosks only used rolls of the 'Machin' definitive designs(for priority mail stamps) and 'Machin 2nd Class' (for economic mail stamps), in its different versions. When the rolls of the 'Machin' design were used up, the staff introduced, in many cases, rolls of other designs and thematic series, depending on the post office stock. 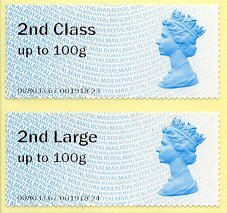 Much rarer and surprising has been the '2nd Class' stamps printed on some of the labels intended for priority mail ... possibly because of an error during the roll replacements.